Human political history has shown us that not all leaders - whether or not chosen by their fellow citizens - are worthy colleagues of the Emperor Claudius (meaning cultivated strategists and brilliant rulers, beloved by his people), but it has also taught us that a minimum of culture and tact is fundamental for the strategic management of political relations. This does not appear to be the case with the current US president, despite his efforts during his first official trip abroad. President Trump planned seven specific destinations on his trip, whose agenda does not convince most critics. His first landing: Riyadh, the capital of Saudi Arabia. Instead of choosing closer destinations - as most Presidents have done since Ronald Reagan - Trump decided to make a pilgrimage through the most important religious centers for the three faiths that run the world: Islam, Christianity and Judaism. Since Donald Trump publicly questioned the birthplace and religious belief of then-President Barack Obama, he has not stopped attacking Islam, with no qualms about letting him know his discontent. During the year 2015, according to the Washington Post timeline, Trump went from evading questions about his stance toward Islam to openly considering shutting down mosques in the country: "I would hate to do so, but it is something we should strongly consider. Some of the ideas and hatred - absolute hatred - come from these areas", he said in an interview with MSNBC after the terrorist attacks in Paris. He also continued to consider creating a database of all Muslims in the United States, while addressing media such as Yahoo and NBC News. Comments like "we are not loved by many Muslims" or "the thing with terrorists is that you have to take out their families", emphasized a speech absolutely ignorant of the reality of Islam, without even contemplating the possibility that an extremist group would not represent the totality of a religion that adds up to 24% of the world's population. As his campaign progressed, his anti-Islamist rhetoric grew, promising to ban Muslims from entering the country once in power. And, to everyone's surprise, he kept his promise. On March 6, 2017, Trump introduced a travel ban to citizens from six Muslim-majority countries, which was later rebutted in the courts. Executive Order 13769 suspended the entry of citizens from Iran, Iraq, Libya, Somalia, Sudan, Syria and Yemen, and suspended the Refugee Admission Program for 120 days. While the order had multiple obstacles on the part of the judicial community and the general population, the President was being consistent with his campaign. 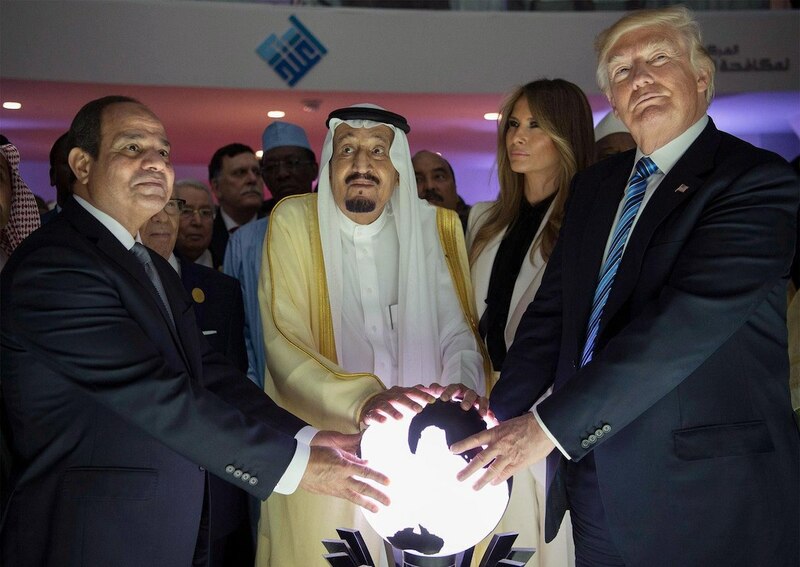 But to everyone's surprise, Donald Trump's first international destination as President of the United States was the cradle of Islam: Saudi Arabia, a country that was not on his administration’s banned countries list. The question is easy: ​​Why did a country that gave rise to 15 of the 19 attackers during the 9/11 was not banned but became the President's first destination? Although the Kingdom of Saudi Arabia committed itself after the attacks to revise its policies of hatred in 2008 - especially its texts that incited rejection of Christians and Jews - three years later, a report from the International Center for Religion and Diplomacy determined that school texts in Saudi Arabia continued to promote violence. To date, and according to the Gulf Affairs Institute, the issue remains the same. A Huffington Post report details that educational books scattered around the world to Saudi students include descriptions of Jews and Christians as "the worst creatures to burn in hell" and that "the spread of Islam through jihad Is a religious duty. " So why does the President decide to visit Saudi Arabia before any other country? Being radically objective, the journey could involve an act of good faith and vindication with a people whom he transformed into the scapegoat of his speech, but the inconsistency in the transformation of his positions raises many doubts. The political agreement with King Salman is an alliance between America and the Sunni autocrats of the Arab world, against the Shiite force of Iran. For Trump this is a "struggle between good and evil" and insisted on the "isolation" of Iran as a strategy to overcome the financing of terrorism. Stephen Miller's speech to the President sought to support his good conduct and raise the tone of his speech of respect and understanding between two nations representing two ideologically opposed peoples. Despite the noble effort, the economic strategy behind his speech was raised from the reinforcement of arms to an area devastated by excessive violence. The US President's strategy was a $ 110 billion arms deal for the Mecca of armed religious groups. After closing the largest arms deal in the history of the United States, President Trump took a flight from Riyadh to Tel Aviv, a route between two nations that do not have diplomatic relations. "I hope one day an Israeli Prime Minister will be able to travel from Tel Aviv to Riyadh," said the current leader, Benjamin Netanyahu, according to ABC News. The brief passage through Israel was plagued by typographical errors by President Trump's communications department, which were not overlooked in the nation (such as confusion with the name of the memorial to the victims of the Holocaust), as well as its very brief note in the guest book, which many compared to the text written by Barack Obama at the time. He also had a brief geographical confusion when he said that "we have just returned from the Middle East," referring to his trip from Saudi Arabia to Israel, not realizing that the Middle East does not belong only to the Arab countries, according to the Times Of Israel. But his presence in Jerusalem was highly symbolic, as the distance taken by President Barack Obama and his nuclear deal with Iran would have weakened relations with the nation. President Trump also met with the Palestinian Authority, Mahmoud Abbas, echoing his mission to unify the opposing parties and bring "peace." Having run the risk of not meeting Pope Francis, the president's advisers requested a meeting with the Supreme Pontiff at the last minute, after waiting for an invitation that, according to protocol, would never arrive. "They had not received any invitation, and I told them 'you will never receive an invitation,'" said James Nicholson, ambassador to the Vatican during the administration of George W. Bush, according to the New York Times. Between exchanges of gifts, a solo meeting for half an hour and many uncomfortable images that filled social networks, His Holiness delivered his 2015 climate change encyclical and did not hesitate to discuss issues such as health, education and assistance to immigrants during the discussions with the US president. Despite the differences between the two - perspectives on immigration, climate change and arms deals - both the President and Pope Francis were able to agree on abortion issues. The Vatican's report on the meeting between them said that both "would have committed themselves in favor of life, freedom of worship and conscience."